Fiona, a baby Nile Hippopotamus, sleeps in her enclosure beside a copy of Saving Fiona, posed for a photograph at the Cincinnati Zoo & Botanical Garden, in Cincinnati. 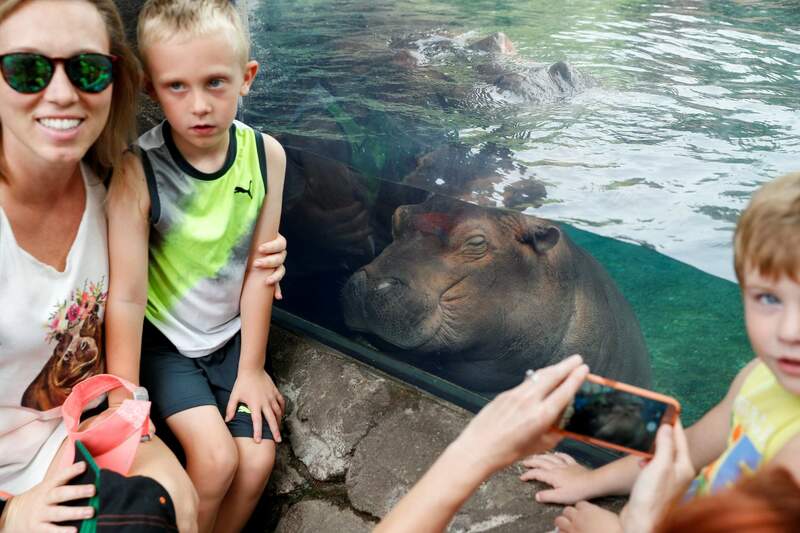 The Cincinnati Zoo’s globally famous premature hippo does more than help sell T-shirts, bobbleheads and ice cream. 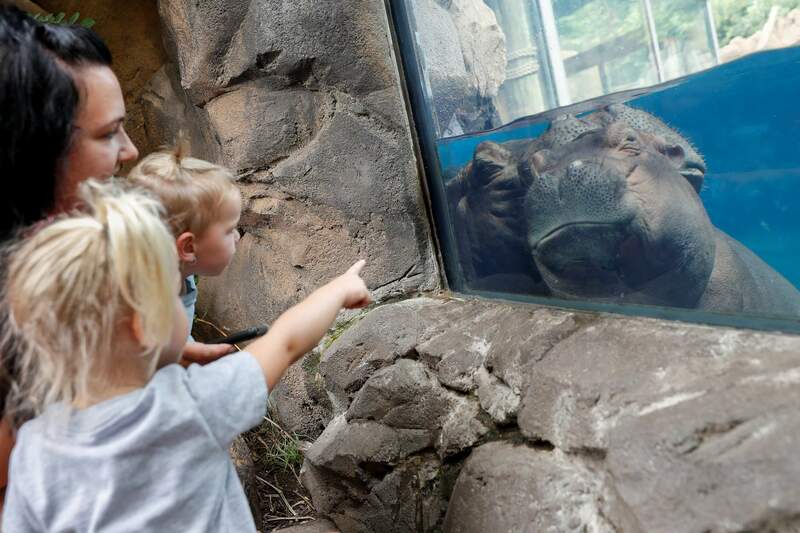 She is becoming a teaching tool in classrooms and libraries and subject of a series of books with the latest by the zoo’s director Thane Maynard. Fiona, a baby Nile Hippopotamus swims in her enclosure at the Cincinnati Zoo & Botanical Garden, in Cincinnati. Fiona, a baby Nile Hippopotamus sleeps in her enclosure as visitors pose for photographs at the Cincinnati Zoo & Botanical Garden, in Cincinnati. Fiona, a baby Nile Hippopotamus sleeps as visitors stop by her enclosure at the Cincinnati Zoo & Botanical Garden in Cincinnati. CINCINNATI – Just call her Professor Fiona. The Cincinnati Zoo’s famous premature baby hippo does more than delight social media fans and help sell a wide range of merchandise. She’s also an educational and literary force, heroine of a half-dozen books so far and a popular subject for library and classroom activities. The latest book is Saving Fiona, (Houghton Mifflin Harcourt) written by the zoo’s director, Thane Maynard. “She has taught us a lot,” Maynard said. 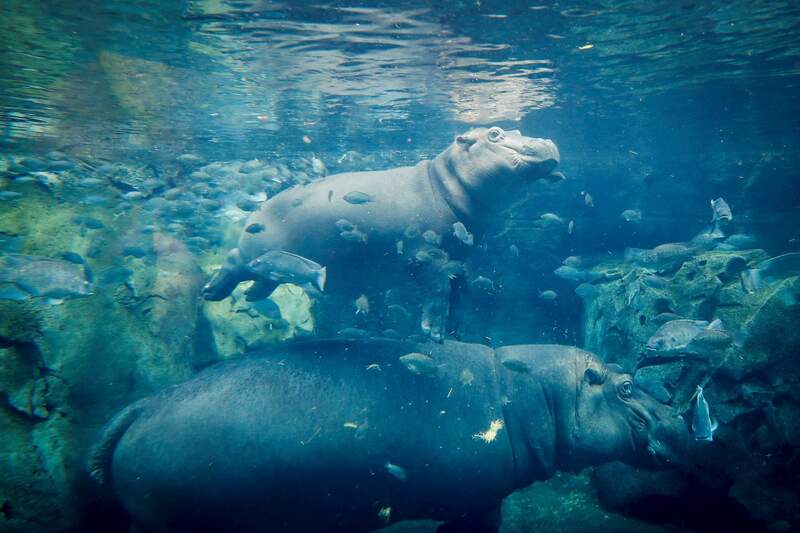 It’s believed Fiona is the smallest hippo ever to survive. Born nearly two months early, she was 29 pounds, a third the size of a typical full-term Nile hippo and unable to stand or nurse. Fiona, a baby Nile Hippopotamus, above, swims above her mother Bibi in their enclosure at the Cincinnati Zoo & Botanical Garden, in Cincinnati. A zoo staffer hand-milked her mother Bibi, and Smithsonian’s National Zoo in Washington helped develop a special formula. Nurses from Cincinnati Children’s Hospital were enlisted to put in a hippo IV. “We were a nervous wreck every day,” Maynard said of Fiona’s first six months after her birth in January 2017. 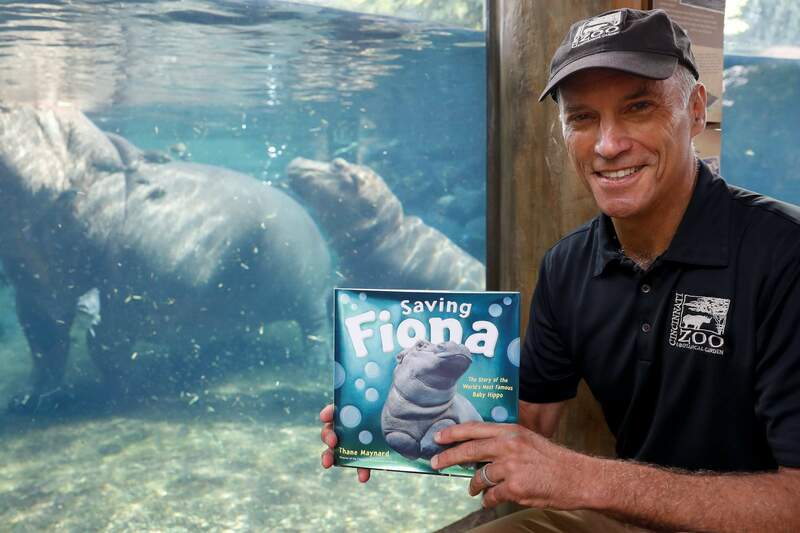 His book is aimed at young readers, telling Fiona’s against-the-odds story while loading in facts about hippos, such as that they can outrun humans and are herbivores that can be dangerous because of their size of up to 5,000 pounds (2,270 kilograms). Educators say students are attracted to lessons themed around animals. Cincinnati Zoo & Botanical Garden Thane Maynard poses for a photograph beside the enclosure of Fiona, their baby Nile Hippopotamus, in Cincinnati. 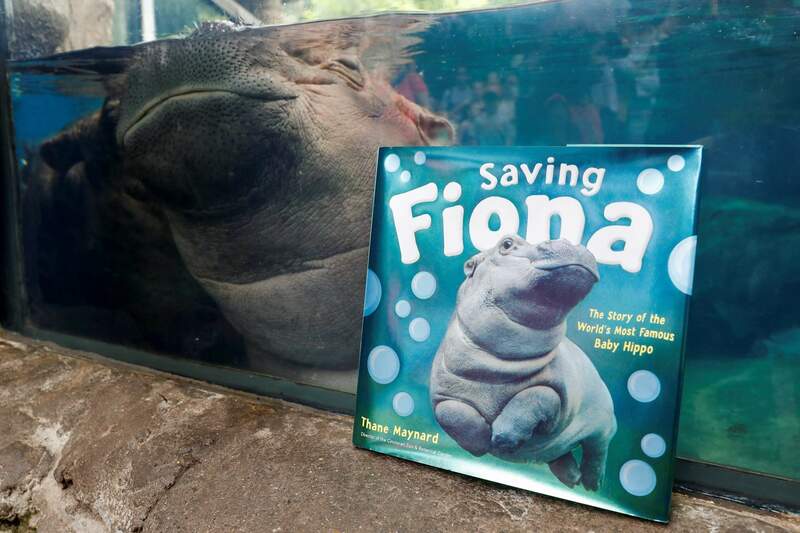 Fiona has been on the cover of three Scholastic Classroom Magazines that reached millions of students with stories accompanied by reading exercises or math formulas such as finding how many bathtubs the water in her zoo would fill. 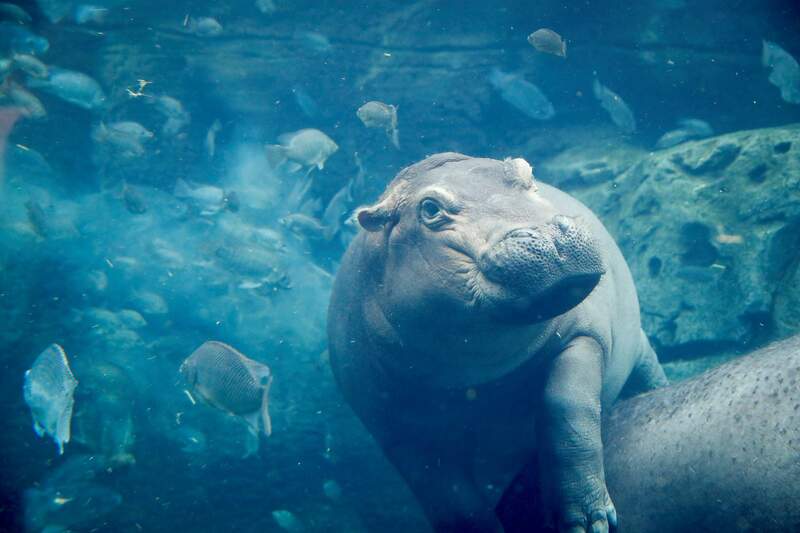 Mike Shriberg, Great Lakes regional director for the National Wildlife Federation, said conservationists see celebrity-type attention to Fiona that glosses over the serious challenges for hippos and other animals facing shrinking habitats and illegal hunting. “There is a deeper message to be conveyed,” he said. However, Shriberg, who said growing up in Cincinnati as a frequent zoo visitor helped lead him into wildlife conservation, said the Fiona mania – which has seen her image marketed on items from playing cards to beer – is a positive development overall.